Museum Development Officer Ewen McPhee and Queensland Museum Conservator Sue Valis recently made an interesting discovery when working on the First World War bound socks held in the Zara Clark Museum in Charters Towers. 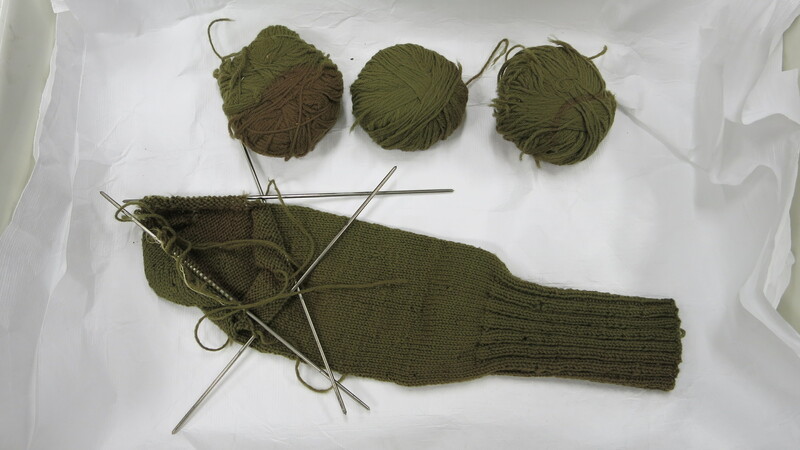 Ewen and Sue had prioritised the rehousing of the socks, knitting needles, calico bag and letter when working as part of a Queensland Anzac Centenary grants program exhibition at the Museum. 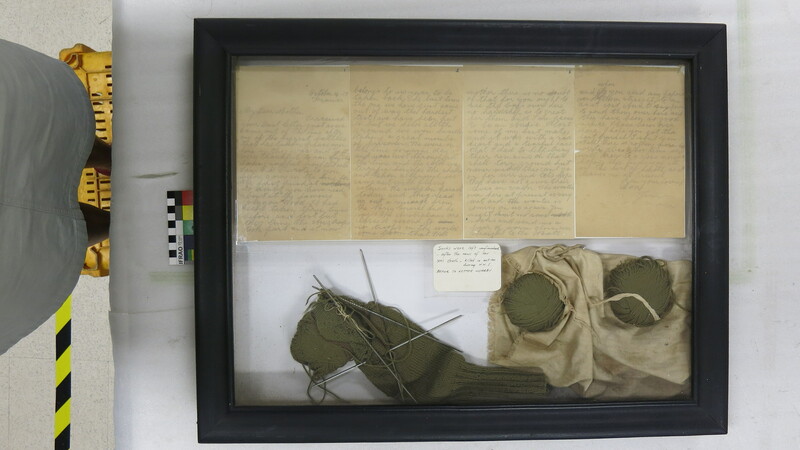 When they were approached by National Trust Queensland to assist with upcoming media, showcasing further research into the First World War Soldier who was to receive the socks, it was a good opportunity to remove them from their original frame and condition report them. The media and personal interest generated by the socks also means that they will be viewed, photographed, filmed and documented by various media and family members in the coming months. Therefore once the socks were removed it was decided to temporarily rehouse them in archival storage materials, allowing for best practice handling, storage and ease of access. The initial opening of the frame revealed some evidence of insect activity although this did not appear to be currently active. Dust had also penetrated the display case and removing the items showed presence of black mould at the base of the frame. The socks and the balls of wool were brush vacuumed to remove dust and the underside of the calico bag, which was most affected by the black mould, was carefully brush-vacuumed under a fume hood. Luckily the mould was dry and was successfully removed. An interesting discovery was made when the socks were removed from the frame. What we first thought were khaki green socks, turned out to be in fact made of brown wool. 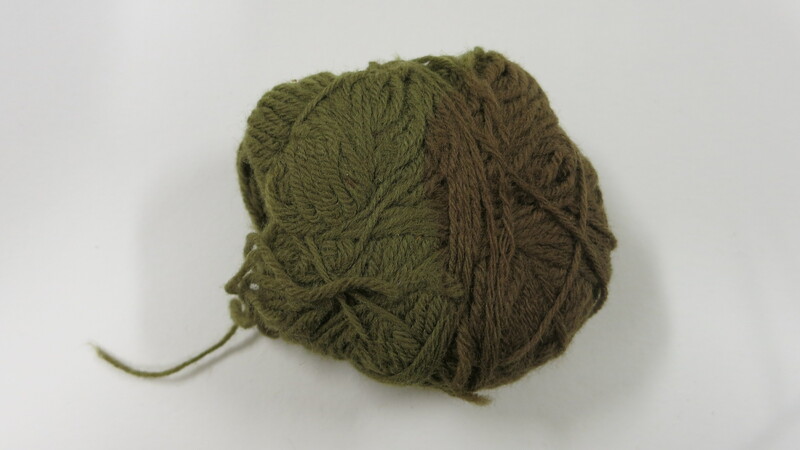 As seen in the images, all the exposed areas of the wool had faded and turned a khaki green colour, while the unexposed parts of the wool were the original brown colour. This fading was due to the combination of exposure to light levels, in particular the ultra-violet component, as well as the wool being dyed by natural, as opposed to synthetic dyes. This is most evident in the images below, particularly on the ball of wool on the top left hand side. Even though the socks were framed and housed inside the museum, in a relatively dark area, it is a good example of damage caused by exposure to high light levels. It also shows how care should be taken when describing objects for research, collection databases and for the media. Posted on 16 December 2014, in Ewen's Diary and tagged ANZAC, Charters Towers, conservation, ewen, North Queensland. Bookmark the permalink. Leave a comment.